A man whose father was killed in the Enniskillen bomb has said uncertainty over where a permanent memorial is to be sited has been very hurtful.The bomb exploded at the town's cenotaph on 8 November 1987.A memorial to the 12 people killed was to be housed on land beside the town's Clinton Centre.However, a Catholic church trust, which owns the land, said it had not yet made a decision on the matter. The memorial has been put into storage. The memorial was unveiled on Wednesday in an event marking 30 years since the attack. Stephen Gault, whose father, Samuel, was killed in the atrocity, said that it had been a very stressful time for the families. "With red tape, in the very last minutes leading up the anniversary, the consent hasn't come from the people who actually own the ground that the memorial will go on," he said.He added that planning permission was granted in July and that there had been "six months of dialogue and investigations into getting planning permission and those who own the land never objected in any way". "But all of a sudden, some several weeks before the anniversary, we came up against this final hurdle and obviously the memorial then had to be removed, it wasn't allowed to stay. 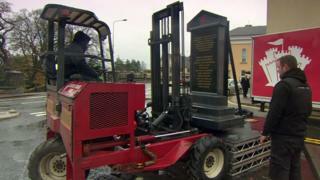 "He said the memorial being taken away in the back of a lorry was "just disgraceful".Sharon Gault, Mr Gault's wife and a Catholic parishioner at the church that owns the land, has written to St Michael's Diocesan Trust asking what "valid objections" it could have.In the letter, seen by the BBC, she wrote: "I am bewildered as to why there would be any hesitation and opposition from St Michael's trustees not to support having a memorial." Speaking to Good Morning Ulster on Wednesday, Mrs Gault said that local clergy "were well aware of plans for the memorial" and there was "absolutely no indication at that stage that there was going to be any objections". However, St Michael's Diocesan Trust said it had only received initial documentation regarding the memorial in late September. "The trust wishes to place on record that, as owner of the property concerned, it was not consulted by the council in relation to the granting of planning permission. "Nonetheless, the trust is in the process of giving due and careful consideration to all aspects of the request and has yet to come to any decision. "There has been engagement between representatives of St Michael's Diocesan Trust and the Ely Centre since the submission of the above-mentioned documentation and we look forward to the continuation of that in the future. "It said that it was "sensitive to the memories and grief being experienced during these days by the families and relatives".